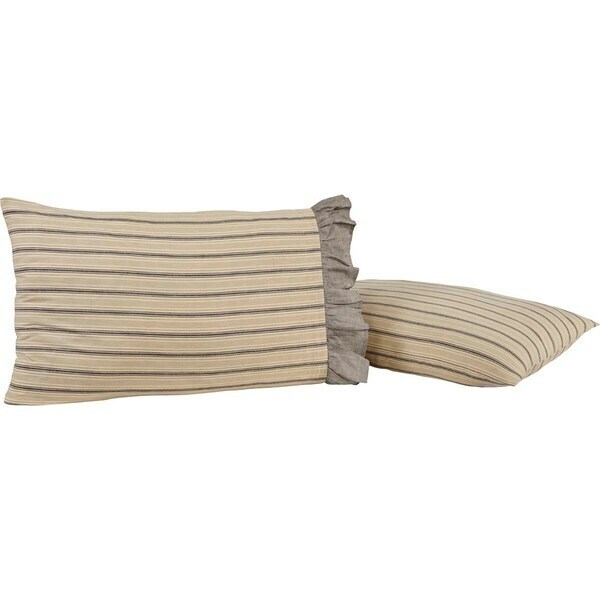 Complete the look of your Farmhouse bed with the Sawyer Mill Pillow Case Set of 2. The body of the pillow cases is a Dark creme and charcoal grey grain sack stripe and trimmed with 4" greige chambray gathered ruffle. Like the size. Enough length so it shows behind the sham. The Sawyer mill pillow cases complete the look to coordinate with our quilt and bed skirt. Super quality . We love the stripes and ruffled edge! The Sawyer Mill Bedding is absolutely perfect! We ordered the whole set...we are decorating our country home in a rustic still and this adds the perfect touch of farmhouse flair. I have been shopping around for the sawyer mill pattern and overstock had it for the best price. Everything was packaged very well. The colors and fabric are exactly as advertised. We highly recommend this bedding for the price and overall look and make. These are very pretty striped cases and are a generous size. The contrasting ruffle has a great quality look! They look wonderful with the Sawyer Mill quilt that I also purchased. I highly recommend this pillow case set.. I purchased these to go with the Sawyer Mills comforter that I also purchased.. Color hue is outstanding as is the quality and workmanship of this item..
Love the pillows cases. Matches everything perfectly. Love the entire bedding set and all the natural colors. Love the farmhouse look. Cant wait to order the throw pillows. It is a beautiful set , I ordered the Sawyer quilt , shams and pillow cases . I am extremely pleased. These are nice pillow cases. I like the design. I would definitely refer a friend. Colors weren't as shown to me. These pillowcases are pretty enough. I’m using them with a Sawyer Mill quilt, 3 Euros, and 2 king shams. The pattern of these pillowcases adds just enough contrast to be interesting on my bed. However, I’m not happy with the weight of the fabric. The thinness of the fabric makes the ruffles sort of flop. But still it all looks pretty on my bed. Beautiful!!! Goes perfectly with my "farmhouse" decor in my bedroom. Super soft and excellent quality. I am very happy with this purchase and I would buy them again! Processing and shipping was very quick. Very pleased with my bedding order.